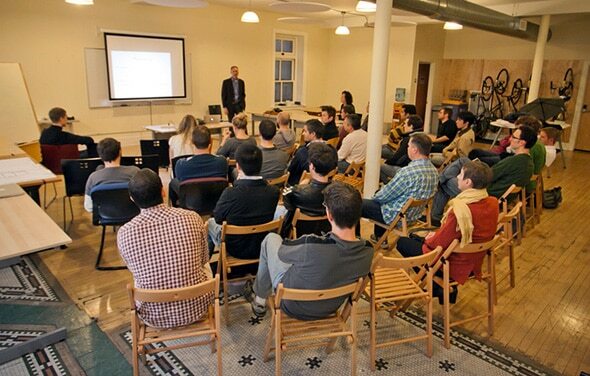 Atomic employees at a quarterly meeting. During the last two quarters, Atomic Object added 10 more employee owners, thanks to a new Employee Share Purchase Program (ESPP). Previous to the ESPP, 13 non-founder employees each owned between 1% and 7% of the company. This system makes it hard to expand ownership because someone has to sell shares before another person can buy them. Under the ESPP, there’s a pool of inactive shares (up to 10% of the total) that employees can purchase. Atomic has set a cap on the amount that employees can invest per quarter, and any employees who leave the company must sell their shares back, adding them to the inactive pool. The program is open to all employees who have been with the firm at least a year. To invest, employees elect to have money taken from their pay checks and put into an account. Once a quarter, that money is used to buy shares. Employees can invest up to $500 each quarter. Turning Atomic Object into a broadly-held company has been Erickson’s vision for many years, but it took some work to find the solution. The current plan was developed with help from attorneys at Warner Norcross & Judd. “They did a great job creating a program that works for a small company,” said Erickson. You can read more about our Adventures in Ownership on Carl’s blog, Great Not Big. The program has been a success, with 10 employees entering the program during its first two quarters and several more planning to do so later this year. Employees appreciate the ability to become owners gradually through a series of small investments.